Princeton Landing News: Where Does Our Money Go? This summer the Association will begin working on its 2010 budget. To get ready for the discussion about next year's spending, we will review the 2009 budget in a series of posts. All of the information we will post has been published previously, either in recent editions of the newsletter or in the 2009 budget mailing all residents received in December, 2008. We'll be providing a summary that tries to make it easier to understand how the Association spends our money. Nearly all of the Association's revenues come from monthly fees paid by homeowners. For 2009, total revenues were expected to be about $3 million. FVCSA planned to spend about 75% of its revenues on operating expenses. The remainder would go to reserves. Initially, our posts will focus on the operating budget. We'll talk about reserves after we've reviewed major expenses. We'll start with the simple pie chart above. You can click on it to see a larger version. 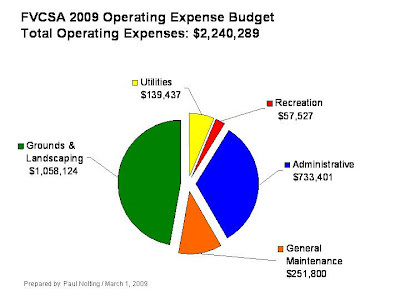 FVCSA's 2009 Operating Expense Budget called for total operating expenses of $2,240,289. Expenses fall into the five categories shown. The two largest categories are Grounds & Landscaping ($1,058,124) and Administrative ($733,401). We'll explain them in our later posts.